At a conference in Stockholm, Sweden, yesterday, the Michelin Tyre Company was implicitly critical of new EU wide tyre labelling regulations that come into force in November 2012. “The new tyre labelling regulations cover wet braking distances, fuel efficiency and road noise, all of which are worthwhile,” explained Michelin Group Vice President Marketing Car and Light Truck Tyres, Gary Guthrie. “But it would have been even more beneficial to the consumer if they had also covered dry road braking distances, tyre life, wet handling and comfort,” he went on to say. According to the EC tests, Energy efficiency is expressed as a coefficient calculated by dividing the machine-measured rolling resistance by the load carried by the tire during the test. On the new tyre label, it will be symbolized by a letter on a colour scale similar to those on household appliances or new vehicles, under the standard energy efficiency pictogram defined by the European Union. Forced by EC Eurocrats to conform to their new Directive, Michelin was very careful not to point out the glaringly obvious. As is the case with the ECDC fuel economy and CO2 tests, the EC tests are lab tests, not real life tests. The seven efficiency classes range from A (the most efficient) to G (the least), with their difference meaning that, for a given vehicle, in theory, a full set of Class A tires could reduce fuel consumption (and with it, carbon emissions) by up to 7.5% compared with a full set of Class G tires. The standards for the Energy Efficiency classes are strict, especially for smaller tires, thereby offering potential for improvement in each tire line. *Performance measured according to testing methods specified in Regulation (EC) 1222/2009, as amended by (EC) 228/2011 and (EC) 1235/2011. Source: European Commission’s Impact Assessment SEC (2008) 2860. The drive by noise measurement is in decibels, but actually an increase of 3 decibels is equivalent to twice as much noise, so three stripes on the label means twice as much noise as two stripes. In launching its new Michelin Energy + car tyres and Agilis + light van and truck tyres, Michelin has ensured they qualified well in the new labelling criteria. But the Michelin Total Performance philosophy also encompasses dry road braking, tyre life, wet road handling and comfort. In fact, 70% of all motor vehicle crashes occur in dry conditions and only 30% in the wet. 60% occur in urban condition. 75% on straight roads and 25% on curves, though crashes on curves tend have more severe consequences. 99% of crashes that occur in wet conditions happen when roads are only very slightly damp. To test its new range of Energy Saver + tyres against the most recent tyres by four top competitors in real life, Michelin employed DEKRA to drive them in convoy a total of 30,480 kilometres in controlled conditions over the length and breadth of Europe during a period 5th April 2012 to 20th June 2012. The tyres were swapped car to car in the same locations on each car every day. Fuel consumption was strictly monitored. Weather conditions, temperatures and average speeds carefully recorded. A wet braking test was carried out at TUV, Berlin at 18,000 kilometres, where the Michelin Energy + stopped an average of 1.2 metres shorter from the other tyres. Over the entire test distance of 30,480 kilometres the average temperature was 17C, the average speed was 82kmh, and the average fuel economy was 5.5 litres per 100 kilometres (51.5mpg). Based on wear at 30,480 kilometres, extrapolate longevity of the Michelin Energy + was 47,100 kilometres to 1.6mm. This is an average 9,300 kilometres more than the four other tyres. The Continentals would last 11,700 kilometres less; the Goodyears 9,200 kilometres less; the Bridgestones 8,300 kilometres less and the Pirellis 8,200 kilometres less. Fuel economy of the Michelin Energy + worked out at a saving of 211 litres over an extrapolated life of the tyres of 47,100 kilometres, or 200 litres over 45,000 kilometres, compared with a tyre that meets the minimum performance level defined in the European tyre labelling regulation. That is 60 litres better than Michelin’s previous generation Energy Saver tyres. 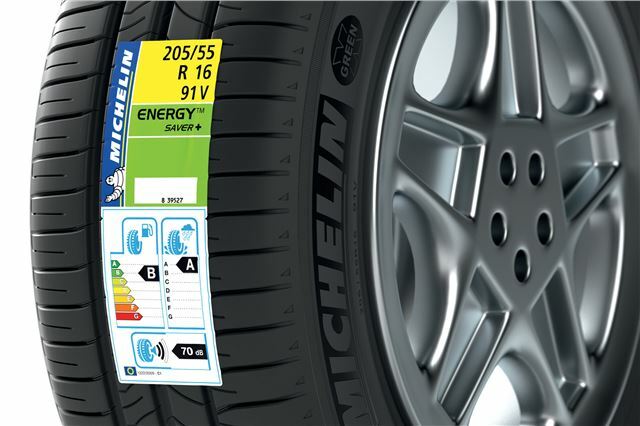 In the new tyre labelling regulations, Michelin Energy Saver + are rated Class A for wet braking, class B or C for fuel economy (depending on tyre size) and meet the new limits on tyre noise. Though not tested over such a great distance, Michelin calculated from its tests that its new Agilis + light van and truck tyres would save a average 270 litres for every 60,000 kilometres travelled, compared with a tyre that meets the minimum performance level defined in the European tire labelling regulation. The Michelin Agilis+ for light trucks shortens braking distance bymore than 17 meters on wet pavement, compared with a tyre that would receive the minimum European label rating. On the new Tyre Labels, the Michelin Agilis + achieves a grade B for wet grip, an grade C for energy efficiency and two waves in outside rolling noise. Michelin has also developed a new tyre for electric vehicles, first appearing on the forthcoming Renault Zoe and estimated to improve their range by 5% - 6%. Currently there are around 800,000,000 vehicles on the World’s roads. This is estimated to rise to 1,600,000,000 vehicles over the next 20 years and to 2,500,000,000 by 2050. Over the past 20 years Michelin reckons to have saved the planet 15 billion litres of fuel from its energy efficient tyres. Over the next 20 – 38 years, as world resources are used up, energy efficiency and consequent reducing CO2 from vehicles will become ever more important if the planet is to survive. We will be testing the new Michelin Energy + tyres against their competitors at MIRA in two week’s time.